I love Project Runway and I think this past season was definitely my favorite so far - amazing talent, Christian & Chris, and some weird challenges that made for some great t.v. (wrestling challenge anyone?) I'm slightly in withdrawal so I thought I would post a few things to honor the memory of season 4. 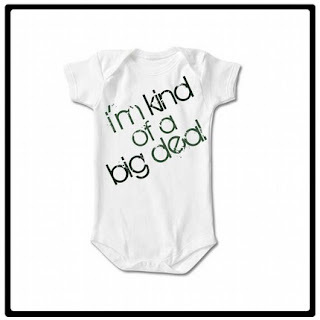 Above is a fierce little onesie by Rosalyn's Closet that makes me wish I had a cute baby to put it on. Here is a fab Q&A with winner Christian Siriano that shows his (slightly) less dramatic side. *Sigh* I just love him. And lastly, above is Chris March, my other favorite designer (more in personality than aesthetics, though) from the show. He was so sweet & funny and my favorite line he said was "Ah... youth" when he was talking about Christian's tendency to be obnoxious from time to time. Christian and Chris need their own show - I need more!! !